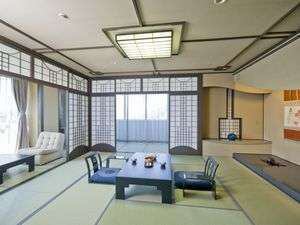 【Main room】22 square meters Japanese-style room, offering views of the under Matsuyama Castle from the room. Hospitality, cooking, time, all "pleasures", the best luxury to fully enjoy. Room Korin Matsu 801 is a special room of the 8th floor Korin Matsu Shofu Ro familiarly nicknamed "Korin Matsu". Western-style bedroom, lounge and ample room. You can also see Matsuyama Castle. The inner bath is a Hinoki Bath. ※Hot water is not a hot spring. Please use the public bath in the hot spring. It is built and you can see the Tenshi surrounded by cherry blossoms in the spring. You can enjoy the view of the mountains in Setouchi in each season. ※Hinoko 's inner bath is not a hot spring.